Single-seat close support, ground attack and tactical reconnaissance aircraft, with for secondary capability as low level interceptor. Combat capable two-seat version used also for advanced flying and weapon training. 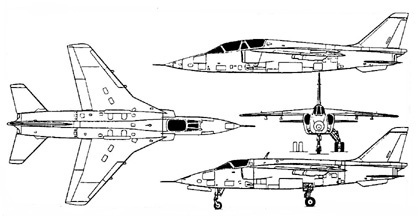 Joint design by Romania (INCAS) and Yogoslavian (VTJ) engineers, started in 1970 under original project name YUROM, to meet requirements of both air forces; two single-seat prototypes started in each country 1972, making simultaneous first flights 31 october 1974: first flight in each country of a two-seat prototype 23 January 1977; each manufacturer then built 15 pre-production aircraft (first flight 1978); series production began in Romania (IAv Craiova, now Avioane) 1979, in Yugoslavia (SOKO) 1980. 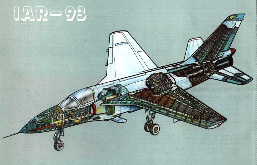 IAR-93A: Romanian single and two-seat versions with no-afterburning Viper Mk 632-41 turbojets; first flight 1981; production completed. IAR-93B: Romanian single and two-seat versions with afterburning Viper Mk 633-47 turbojets; first flight 1985. Wing of NACA 65A-008 (modified) section, shoulder-mounted with 0° incidence and 3° 30' anhedral from roots; sweepback 35° at quarter-chord and approx 43°on outer leading-edges; incidence 0°; inboard leading-edges extended forward (except on prototypes / pre-production) at 65° sweepback; small boundary layer fence on upper surface of each outer panel; fuselage has hydraulically actuated airbrake underneath on each side forward of mainwheel bay, dorsal spine fairing, per-nib fairing, pen-nib fairing above exhaust nozzles, and detachable rear portion for access to engine bays; all-sweptback tail surfaces, plus strake beneath rear fuselage each side. 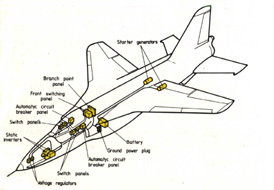 Conventionally built, almost entirely of aluminium alloy, except for honeycomb rudder and tailplane on later production aircraft; two-spar wings with ribs, stringers and partially machined skin; wing spar box forms integral fuel tanks on production aircraft; pre-series aircraft have rubber fuel cells, forward of which sandwich panels. Hydraulically retractable tricycle type of INCAS design, with single-wheel hydraulically steerable nose unit, twin-wheel main units. 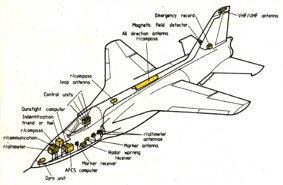 All units retract forward into fuselage. Two-stage AEROSTAR hydro/nitrogen shock absorber in each unit. Mainwheels and tubeless types size 615 x 225 mm; pressure 4,5 bars (65,3 lb/sq in). Nosewheel and tubeless tyres size 450 x 190 mm, pressure 4,0 bars (58,0 lb/sq in). on all afterburning versions. Hydraulic disc brakes on each mainwheel unit, and electronic anti-skid system. Min ground turning radius 7,00 m (22 ft 11½ in). Bullet fairing at base of rudder contains hydraulically 4,2m (13 ft 9½ in) diameter braking parachute. 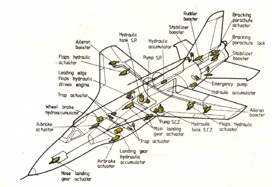 Internally balanced plain ailerons, single-slotted trailing-edge flaps, two-segment leading-edge slats (three-segment on prototype/pre-production aircraft), low-set all-moving tailplane and inset rudder, all hydraulically actuated (except leading-edge slats: electrohydraulic), with AEROTECH servo-actuators for primary control surfaces; no aileron or rudder tabs. Bootstrap type environmental control system for cockpit pressurisation (max differential 0,214 bar ; 3,1 lb/sq in), air-conditioning, and windscreen de-icing/demisting. Two AEROSTAR / Prva Petoletka independent hydraulic systems, each of 207 bars (3000 lb/sq in) pressure, flaw rate 48 litres/min (12,7 US gallons/min; 10,6 Imp gallons/min), for actions of leading-edge slats, trailing-edge flaps, ailerons, tailplane, rudder, airbrakes, landing gear extension/retraction, mainwheel brakes, nosewheel steering, brake-chute and afterburner nozzles. 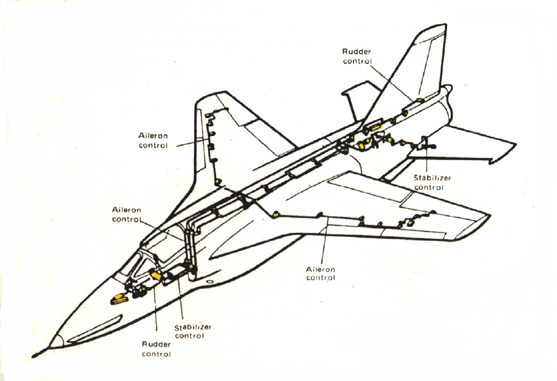 Backup system for landing gear, wheel brakes and primary flight controls. No pneumatic system. Main electrical system is 28 V DC, supplied by two Lucas BC - 0107, 9 kW engine driven starter/generators through two voltage regulators and a switching system, and a 24 V 36Ah nickel-cadmium battery ; four 300VA static inverters for 115 V AC power at 400 Hz. High pressure (150 bars; 2,175 lb/sq in) gaseous oxygen system for crew. Planned retrofit of air intake and wing leading-edge de-icing. Landing light under nose, forward of nosewheel bay; taxying light on nosewheel shock strut. 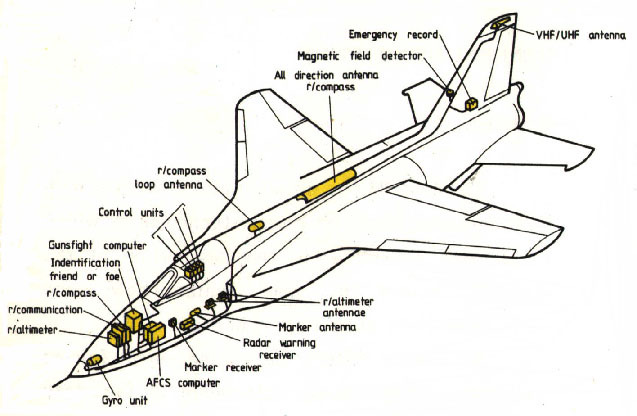 Standard avionics include VHF/UHF air-to-air and air-to-ground com.radio (20W transmission power); gyro unit (Honeywell SGP500 twin-gyro platform in ORAO), radio altimeter, ADF, radio compass and marker receiver; IFF (Romanian IAR-93B aircraft only); and GEC-MARCONI three-axis stability augmentation system, incorporating a basic bank / altitude hold autopilot and emergency wings-level facility. 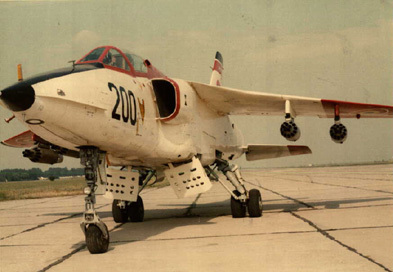 Two 23 mm GSh-23L twin-barrel cannon in lower front fuselage, below engine air intakes, with 200 rds/gun. Gun camera and GEC-Marconi D282 gyro gunsight. 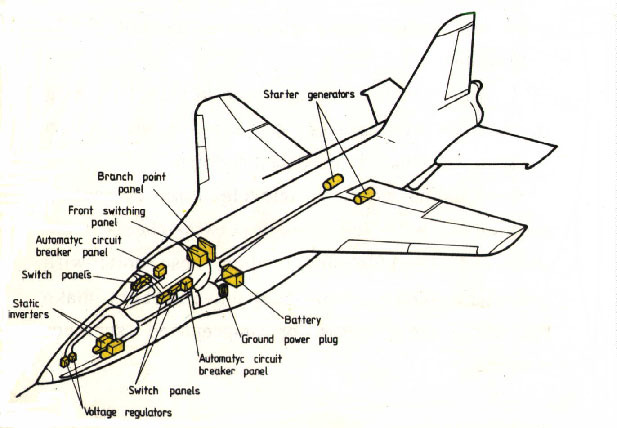 Fire external stores station, of which inboard underwing pair and fuselage centerline station are each stressed for loads up to 500 kg (1,102 lb); outboard underwing stations stressed for up to 300 kg (661 lb) each, giving max external stores load of 1,500 kg (3,307 lb). 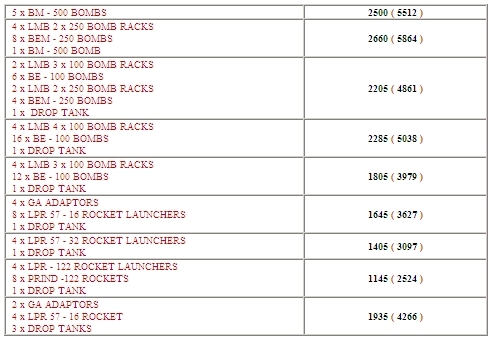 Typical weapon loads can include two or three 500 kg bombs; four or five 250 kg bombs; four multiple carriers each with three 100 kg bombs; two such multiple carriers plus two L-57-16MD launchers each with 16´ 57 mm rockets; four L-57-16MD launchers; four launchers each with two 122 mm, one 128 mm or one 240 mm rockets; a GSh-23L cannon pad with four L-57-16MD rockets launchers; four 160 kg KPT-150 or similar munition dispensers; or four L-57-32 launchers each with 32´ 57 mm rockets. 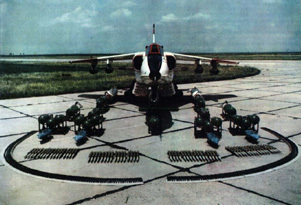 Some IAR-93Bs equipped to carry up eight air-to-air missiles, on twin launch rails, on four underwing station. Centreline and inboard underwing points can carry drop tanks. Two 17,79 KN (4,000 lb st) Turbomecanica/Orao (license built Rolls-Royce) Viper Mk 632-41 turbojets, mounted side by side in rear fuselage; air intake on each side of fuselage, below cockpit canopy. 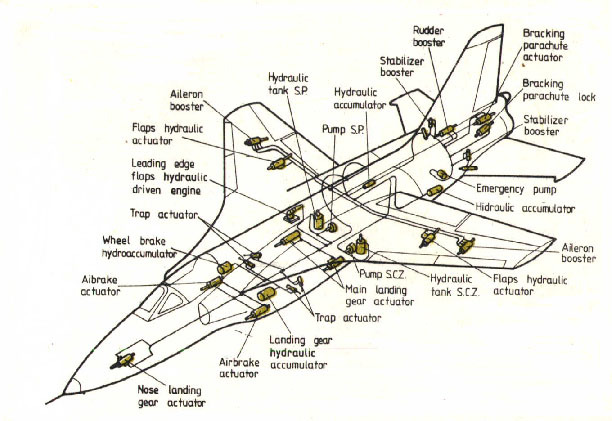 Pre-series aircraft have seven fuselage tanks and two collector tanks, with combined capacity of 2,480 litres (655 US gallons; 545,5 Imp gallons), and two 235 litre (62 US gallons; 51,75 Imp gallons) rubber fuel cells in wings, giving total internal fuel capacity of 2,950 litres (779 US gallons; 649 Imp. gallons). Provision for carrying three 500 litre (132 US gallons; 110 Imp. 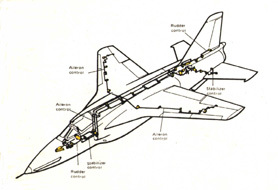 gallons) auxiliary fuel tanks, one on underfuselage stores attachment and one inboard under each wing. 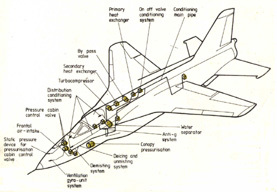 Pressure refuelling points in fuselage below starboard air intake; gravity refueling points in fuselage near starboard wing trailing-edge and in each external tank. Oil capacity 6,25 litres (1,65 US gallons: 1.37 Imp gallons). Two Turbomecanica/Orao (license build Rolls-Royce) Viper Mk 633-47 turbojets, each rated at 17,79 kN (4,000 lb st) dry and 22,24 kN (5000 lb st) with afterburning. 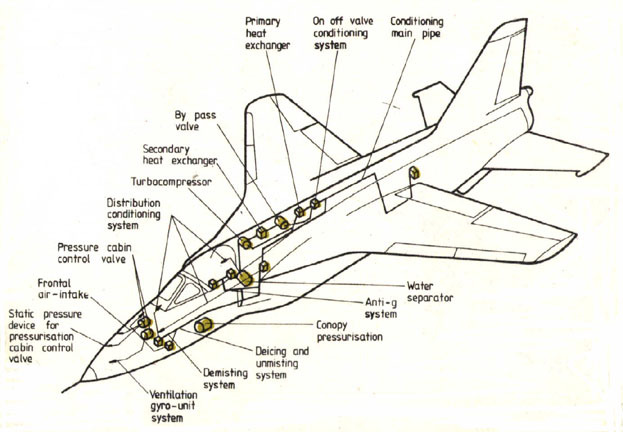 Production aircraft have fire fuselage tanks and two collector tanks, plus two integral wing tanks, giving total internal capacity of 3,120 litres (842 US gallons; 686 Imp gallons). 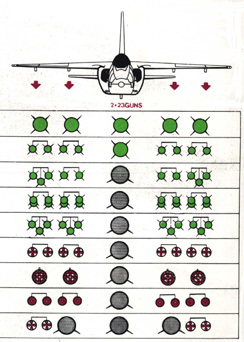 Drop tanks, refuelling points and oil capacity as for non-afterburning version. Single-seat or tandem two-seat cockpit(s), with Martin-Baker zero/zero seat for each occupant (RU10J in IAR-93, Y-10LB in ORAO), capable of ejection throught canopy. Canopy of single-seat IAR-93A and J-22 hinged at rear and actuated electrically to open upward; single-seat IAR-93B, and all two-seaters, have manually operated canopies opening sideways to starboard. All accommodation pressurised, heated and air-conditioned. Dual controls in two-seat versions.